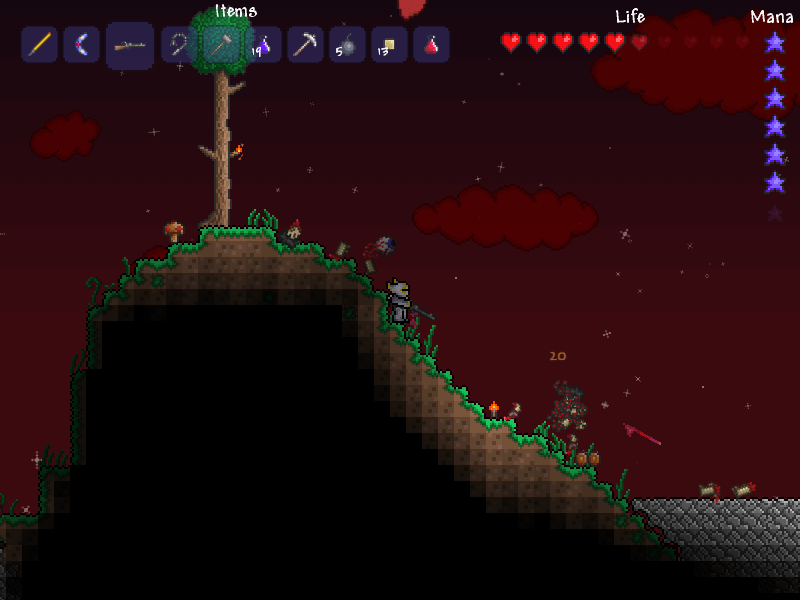 This is my opinion/review of Terraria, a 2D sandbox game in the vein of indie smash-hit Minecraft. 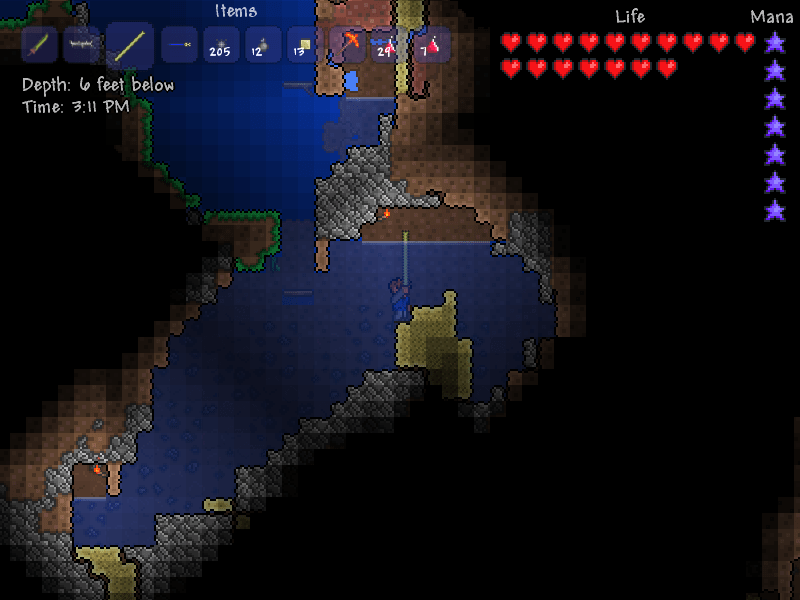 What separates Terraria from Minecraft, and is it a good game in it’s own right? Let’s find out. Terraria is not Minecraft in 2D. Minecraft is about exploring, creating and experimenting. Terraria is a more of a dungeon crawler with crafting and building elements tacked on. I do mean tacked on, because the game would almost be better if they took crafting out. Finding gear underground or in chests is an old, tried-and-true, almost overdone concept but it fits here. If I didn’t have to gather random things, haul it back to my house, and then build whatever I need, I could spend more time doing to fun part of the game – spelunking. Perhaps a menu-based store would be a better way to go. If there’s one thing the game does well, it’s the thrill of exploring. Travelling overland can bring you across different terrain, bringing with them different dangers/rewards Going underground is even more enticing and there are more terrains, rewards and monsters to be found there. As for the loot you can find and make, there’s an ton of cool gear. Explosives like grenades and sticky bombs, guns, fiery great swords, items hat give movement bonuses, tell you your depth, regenerate health, and even allow flight. This is where Terraria blows Minecraft out of the water. It’s also where it comes into it’s own. Gathering the best gear and conquering the toughest monsters is the best part of the game. The monsters, in fact, are also great. There are plenty of standard monsters, but the most entertaining are the boss monsters. By hitting certain triggers you can summon boss monsters, including the Eye of Cthulu seen here and the worm-like Eater of Worlds. These are epic encounters unlike anything seen in Minecraft and bring to mind MMO dungeon bosses. Terraria is fun and definitely not a Minecraft knockoff. It’s more then unique enough to stand on it’s own and attract it’s own audience. Personally I’m not the biggest fan of it’s control scheme (WASD isn’t real intuitive for a sidescroller and my mouse work was prone to errors due to the controls) but Terraria is fun nonetheless. You can even start a server inside the game for multiplayer action. There’s something to the action here to be enjoyed by most players. I’m just disappointed in the crafting implementation. It could be done better, or even removed entirely to place the focus where it belongs – on the adventuring. It’s not a must-buy but it it sounds remotely interesting to you I’d take a chance on it.